Roy Johnson graduated with a B.S in Biology from Colorado State University in 1975. In 1979, after completing three years of training at the University of Munich, College of Veterinary Medicine, Dr. Johnson transferred to the University of Illinois, College of Veterinary Medicine in Urbana-Champaign. He received a B.S in Veterinary Science in 1979 and his Doctor of Veterinary Medicine in 1982. He has worked in many aspects of the veterinary medical profession including large animal, mixed practice, small animal and emergency veterinary medicine and surgery. He has also worked outside his field. In 1981-1983 he did research in blood borne diseases of cattle working on a vaccine for Anaplasmosis under Professor Miodrag Ristic at the University of Illinois, a leader in the field. He was an owner-operator of a veterinary hospital for seven years while living in Albuquerque, New Mexico in the late 1980s and early 1990s, among other veterinary-related positions. From 1995-2004 Dr. Johnson was employed by Trinity Springs Ltd., a small bottling company in south central Idaho. He was responsible for developing the quality assurance system for this company. He managed the quality system and conducted quality audits for the company in his last two years there. In 2004-2006 he was a research scientist under Professor Bruce Fouke in the Department of Geology at the University of Illinois. His focus was on the microbiological influence on the precipitation of calcium carbonate in hot water spring systems and coral. He is co-author on three peer reviewed articles in leading journals. He also developed skills in scanning and transmission electron microscopy. 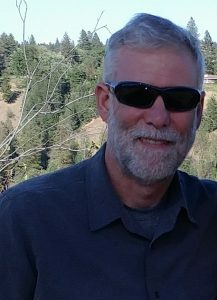 Dr. Johnson spent four years in Houston at Shell International between 2012 and 2016 doing basic research on sustainable alternatives to fracking. He helped successfully document a process that could radically improve the current process now being employed. He spent over 5000 hours doing atomic force microscopy during that time. Dr. Johnson taught anatomy and physiology at a local for-profit college in Boise and worked as a part of the Sun Valley Animal Center team for three years before moving to Houston. Currently, he again is working at the Sun Valley Animal Center and does consulting for bottled water facilities. He is married, has two grown children and bases out of Bellevue, Idaho. His wife Barbara has deep roots in the Wood River Valley and is a master gardener and artist. They have an extremely intelligent rat terrier-miniature schnauzer-poodle mix that they rescued who runs the shop at home.